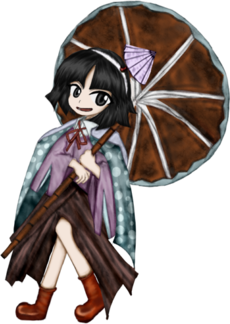 Jun Amanomiya (天宮　潤, Amanomiya Jun) is a courteous and polite youkai who sells umbrellas and is Shou Amanomori's best friend. A running gag in the Len'en Project is that they always get attacked by the heroes for no reason just for being there. Jun is the first stage boss of Earthen Miraculous Sword and Brilliant Pagoda or Haze Castle, the second and fourth game of the Len'en Project respectively. Jun has a mature and dignified personality. As a merchant, they don't like people who are discourteous, but other than that, they're generally friendly towards humans. Despite been a rain youkai, they don't like rain and moisture because it gets their clothes wet. Jun likes to sing their own songs, but is embarrassed if they're seen singing by other people. Shou Amanomori is very fond and protective of Jun and similarly, Jun is protective of Shou too and the two are often seen together (not in-game, but according to Sese Kitsugai). Because they're related to a rain god, they have the ability to make it rain. It's said they make it rain in order to sell their rain gear, but if they don't make the rain fall then they can't make a living. Their character may be a homage to Letty Whiterock . Both are Stage 1 bosses and they have no relation to the incident, but get blamed because of it, because of their control over a water-element (Letty was blamed for the long winter while Jun was blamed for the cloudy weather). They're also close to a Stage 2 boss who is considered a fool (Chen and Shou Amanomori respectively). Their full name is Jun Amanomiya (天宮　潤). Their given name, 潤 (Jun), is spelled with the kanji that means "wet", but it can also be translated to "Profit" in Simplified Chinese. Their family name, Amanomiya (天宮, lit. "shrine of the heavens"), is a real Japanese surname as well as the name of a shrine. Unusually, there's no meaning for a bird. Jun has short hair in a bob cut and grey eyes, but black eyes in Brilliant Pagoda or Haze Castle. They use raingear as headwear, even for sunny days. They wear pink and red clothing, with a blue cape with polka-dots, as protection for the rain. According to JynX, they are actually young for a youkai and they're in their late teens. Their teenage appearance is because they're actually a teenager. In Earthen Miraculous Sword, they get attacked by the heroes just for being there. Because they related Jun's powers to the incident, believing them to be the culprit and attacked them. After their defeat, Jun's friend Shou Amanomori goes to avenge them, but they're unsuccessful. Jun introduces them-self to Yabusame Houlen and tries to sell some raingear, but the human believes they were being eavesdropped. Realizing that Yabusame wasn't paying attention, Jun introduces them-self again, letting it slip that they are a rain youkai. Yabusame accuses Jun of being the culprit and attacks them. After Jun is defeated, Yabusame is surprised that Jun is still alive, ignoring the condition of youkai in general. Tsubakura Enraku encounters Jun and both talk about how problematic is the rain. Because of the little umbrella on Jun's head, the human recognizes them as a rain youkai. Tsubakura accuses Jun of being the culprit and attacks them. After Jun is defeated, Tsubakura is relieved that they beat the culprit and the incident is solved. Jun tries to say that they aren't related to the clouds incident at all, but Tsubakura ignores them and flies away. Kuroji Shitodo encounters Jun, who is surprised to see a flying human and comments the times have changed. Jun also recognizes Kuroji as one of the humans spirited away by Tsurubami Senri. Kuroji realizes Jun is a rain youkai and accuses them of being the culprit. Jun doesn't deny this, but decides to fight against Kuroji, believing that because they are a human, young and inexperienced, it will be easy to defeat them. That doesn't turn out to be the case and Jun is defeated. Once again in Brilliant Pagoda or Haze Castle, Jun is at the wrong place at the wrong time and because the incident is related to weather, the heroes believe Jun to be the culprit and is attacked pointlessly. Jun will appear randomly as the Stage 1 Boss if the player takes the neutral route, and can appear randomly as a midboss anywhere from stage 2 onwards. Jun is flying idly above the sky as they sing a song about rain. Yabusame Houlen and company overhear Jun, much to Jun's embarrassment. Tsubakura Enraku concludes that because they're a rain youkai, they're the culprit, despite Jun's warnings. After their defeat, Shion consumes their soul, but since Jun is a youkai, they find it painful but doesn't die. When Shou Amanomori goes to avenge Jun's defeat as usual, Tsubakura reveals that they knew Jun wasn't guilty and just attacked Jun for the heck of it. Jun runs into Taira no Fumikado's group and introduces them-self as a rain youkai. Fumikado concludes that if they can control rain, they can control the skies as well, despite Jun saying that it's not the case. In order to prove that they're the rightful New Emperor and everything belongs to them even the skies, Fumikado and their lackeys attack the youkai, Jun is defeated again. Shou Amanomori is their best friend. They stay close to Jun, because as a slug-youkai, they love rain and Jun is a rain youkai, so Shou can induce their ability on them to make rain. Everytime Jun gets attacked for no reason, Shou goes to take revenge on the ones who attacked them. According to Sese Kitsugai, the two are always seen together and similarly, Jun is very protective of Shou. Jun is the first youkai to be a boss in the Len'en Project, this being in second game Earthen Miraculous Sword. According to Shou, Jun's favorite pastime is sewing and their favorite food is noodles.